Back: Matt and Sora. Front: Ezekiel, Naomi, Hosanna, and Isaiah. We’re Matt and Sora Colvin. We’re missionaries with SAMS-USA and the Reformed Episcopal Church. We spent three years serving in Davao City, Philippines, and are currently preparing for a new placement in Indonesia. 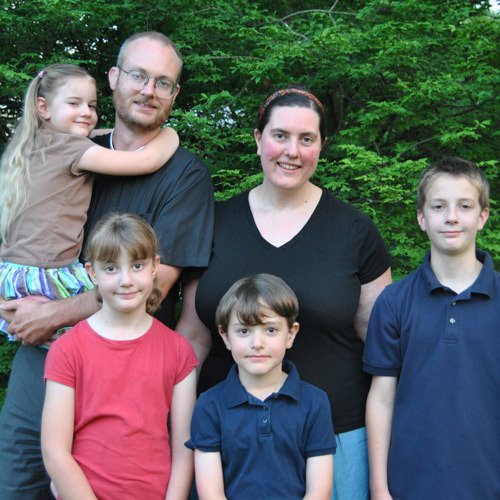 Matt is a skilled teacher of Biblical languages, with a PhD in Greek from Cornell University. He is a presbyter in the Reformed Episcopal Church and the ACNA, and has spent three years as a missionary teaching Bible, Greek, and Hebrew in the Philippines. He is passionate about helping others understand the Scriptures. Sora is an experienced midwife and midwifery educator. During the Colvins’ placement in the Philippines, she was involved in training both Filipinos and missionary midwives and also participated in medical disaster response after Typhoon Haiyan. 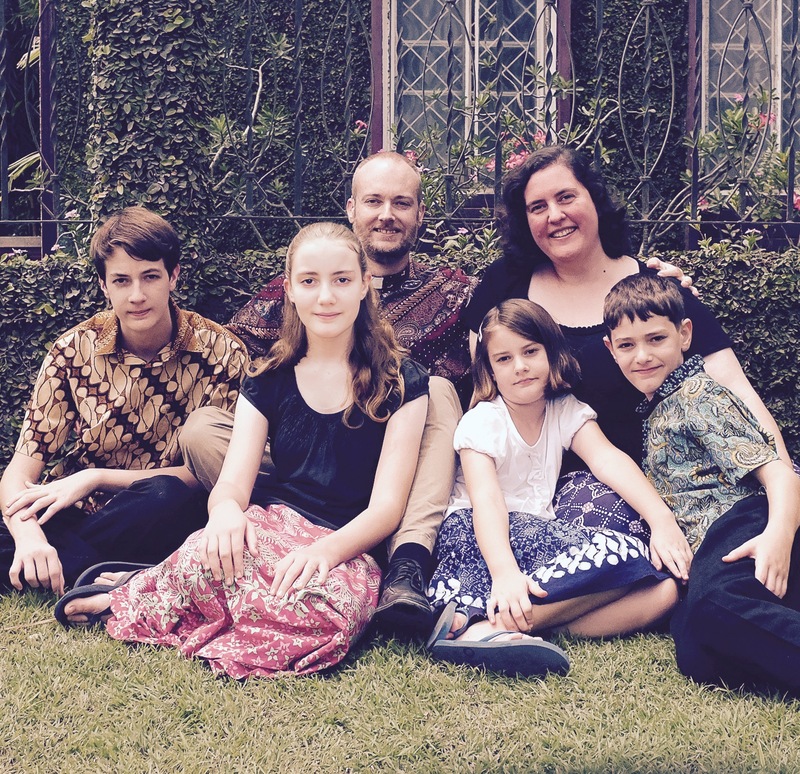 The Anglican Church in Indonesia (Gereja Anglikan Indonesia) has asked for the Colvins’ help in starting a new seminary, St. Andrew’s, in Bandung, West Java, to train Indonesian clergy for the ministry of Word and Sacrament. We hope to leave for Indonesia in June 2016, after a 6 month home ministry assignment in the U.S. and Canada. We are Matt and Sora Colvin, and we are seeking to use the gifts God has entrusted us with in His service. We believe we are called to use what we have received with meekness to bless others, to be “doers of the word.” As we strive to follow Christ’s call on our lives, our family has moved from Mason, OH to Davao City, Philippines. We’d like to invite you to share our journey. Matt is a teacher, by constitution, intellectual habits, and training. He gets excited about learning new things about the Bible and is happiest when explaining Biblical stories in a way that makes them more vivid and teaches people to notice things that they otherwise might not. After earning a PhD in Classical Greek Literature and learning Biblical Hebrew over the last five years, he has many tools for reading and explaining the text of the Bible. Matt has taught high school history, literature, Latin, and Greek at Mars Hill Academy. Matt has also taught men’s Bible study at Trinity REC for the past seven years and frequent adult Sunday school classes as well. He is a deacon in the Reformed Episcopal Curch. Matt blogs about the Bible and theology (including commentary on the daily office readings of the REC Lectionary) at Colvinism. In 2009, Sora, then a midwifery student, went to the Philippines for the first time to do a clinical internship at a charity birth center. She returned again the following year and has spent a total of six weeks volunteering at the clinic (her experiences there were chronicled at her midwifery/travel blog, Puah’s Corner.) Sora’s motive for going in 2009 was primarily to gain experience to further her progress as a student midwife. She also thought (in a rather abstract way) that she might want to do some short-term medical missions trips in the (distant) future and that it might be useful to have had this sort of experience as a student. She was not expecting that the trip would be the occasion for any particular spiritual growth and certainly not that it would spark a deep-rooted and sustained discontent with the suburban North American lifestyle or an urgency to actively pursue serving Christ as a midwife in the developing world. She was blown away by what God is doing through the missionary midwives she worked with. She had also come face to face for the first time with the reality of life in the developing world and the desperate need for midwives among the world’s poor. Though on her return to life in Ohio, she was immediately busy with family, friends, and church, completing her midwifery certification, and building a practice here, she had come home with a deep and abiding desire to use the skills and talents God has given her in service to Christ in the developing world. We believe best starting point for pursuing this dream is first to return to the Philippines for further training. Though Sora is already certified as a midwife and has successfully managed a busy practice in Ohio for some time now, there are many aspects of medical care in developing countries that are very different than in North America. The director and staff at the clinic have over 17 years of experience in the intersection of midwifery and cross-cultural missions and a commitment and vision to ensure their students become both the clinically competent maternity care providers that are so desperately needed, and also culturally sensitive missionary midwives. Working with them will prepare her to better serve in any other location God where might lead our family. Sora has been accepted into a program that will enable her to earn a Bachelor of Midwifery degree from the National College of Midwifery, a US-accredited school based in New Mexico, while volunteering at the birth center. Her current certification will give her advanced standing in the bachelor’s program, requiring only a research thesis and clinical hours to complete the degree. During the year that Sora will be writing her thesis, she will also gaining valuable experience working as a midwife in a developing world context, learning how to run a birth center, and how to effectively teach and train midwifery students. In November 2011 when we first posted, we were very certain of Sora’s calling in Davao but not as clear about what Matt would be doing there. We wrote: “Matt sees his primary and immediate calling during the time that Sora is in school to be the teaching of his own children and the training of them in the faith. This immediate calling of fatherhood will be enough at the beginning while our family makes friends, builds relationships, and waits patiently for God to put in our way whatever good works He has prepared for us to do.” We trusted that other ministry opportunities for Matt would become clear after we arrived in Davao. In May 2012, Matt was invited to join the faculty at Faith Academy Mindanao, a K-12 international school in Davao City which primarily serves the children of missionaries. (The teachers at Faith Academy are all donor-supported missionaries and do not receive a salary from the school.) Matt is excited about using his gifts as a teacher in a way that will bless other missionary families and help them to serve. We left North America at the end of December 2012 and are now living and serving in Davao City. My name is Danielle Wilson and I applied for Newlife for their 2012 school year also! I’m curious, when did you find out you were accepted, since I was told I wouldn’t find out until next month? Because I am already a CPM, I applied for the Bachelor’s program, not the associates’ degree program. Different programs, different application processing time frames.